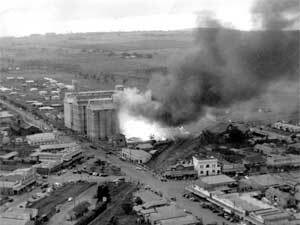 In 1951, the Peanut Marketing Board (now PCA) hit the news headlines with a fire at its Kingaroy silos. Fortunately no one was seriously hurt but the fire completely destroyed the original wooden silos built in 1928. 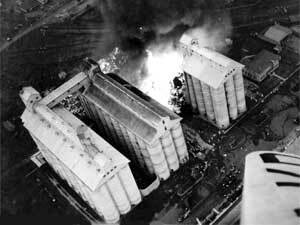 The local newspaper, the South Burnett Times, reported on the dramatic incident on February 8, 1951:”A huge fire on Tuesday last caused damage estimated at more than £100,000 to the Queensland Peanut Marketing Board’s silos and other installations at Kingaroy. No 1 silo, with approximately 700 tons of loose ungraded peanuts, and a two-storied shed containing hundreds of thousands of empty bags were all destroyed. The fire also spread to No 2 and No 4 cement silos and destroyed some wooden framework. Water from the Kingaroy water supply was diverted entirely to quelling the blaze and maintaining a supply to the local hospital. Local residents joined in the fight and greatly assisted the firemen in their efforts. Salvation Army and Red Cross workers with other local women served food and refreshments to the exhausted firemen. Much valuable machinery for shelling, grading, cleaning etc and conveyor belts were destroyed with the No 1 silo and bag shed. Hoses were played on nearby buildings as well as on the three cement silos in the board’s premises. 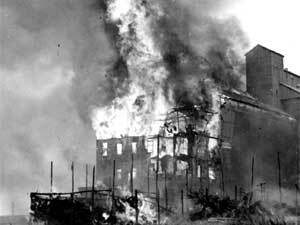 Volunteers carried pews, furniture and an altar from the Church of England nearby and hoses were played on the church walls when flames leaped in that direction.